Welcome back! Check out this Top 10 here or on my website! This is a continuation of last week’s Top 10 Phallic Superheroes, which got many chuckles out of my readers! Enjoy. 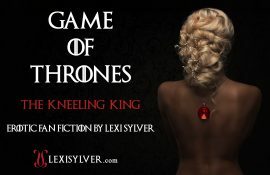 If you haven’t yet, check out my latest seductive story, All The Queen’s Men. Read it here or on my website! Plus, take a peek at a special interview between Fantasia Lillith and I. All The Queen’s Men was inspired by one of her reader’s challenges! Check back Sunday for my new Position of the Week!